Most Advertisers are using a performance based revenue model. Because of that, tracking is one of the most important parts of our technology and service. First of all you have to choose the tracking method you want to use. Desktop Advertisers can choose between 1st Party, 3rd Party cookie and postback tracking. We recommend to implement 1st Party cookie or postback tracking because of the higher accuracy and the fact that some browsers started to block 3rd Party tracking. The tracking implementation for mobile Advertiser depends on the attribution partner. You should always discuss the setup with your assigned Account Manager. Besides the technical implementation on your website or in your app, you need to configure your desired tracking setting in the Tracking section of your Offer in the platform. It´s mandatory to add the default target URL of your Offer. All ads without custom target URL will link to this URL. Optionally you can add default target URL extension like utm parameters. The extension will be added automatically to all target URLs, including custom target URLs. If you are using adding a query string in this fields, you don't have to add the ? at the start, it will automatically be added. In case you are using the same URL parameter in both the default target URL extension and a custom target URL, but with different values, the value from the custom target URL will be used. For example, if you use as default target URL extension utm_medium=affiliate and for one ad the custom URL includes utm_medium=email then utm_medium=email will be used.. 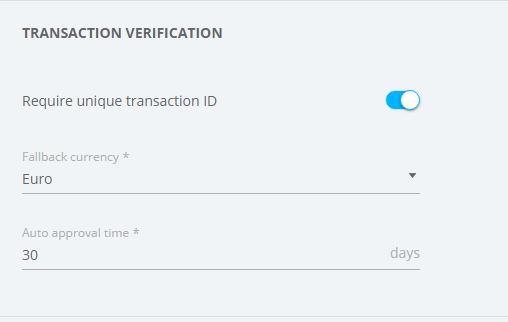 If You decide that a unique transaction ID is required, You have to make sure that you pass unique IDs for each transaction in the pixel / tag / postback URL. All duplicates will be tracked with the status failed once this feature is activated. The auto approval time is the period after which all pending transactions get approved automatically. 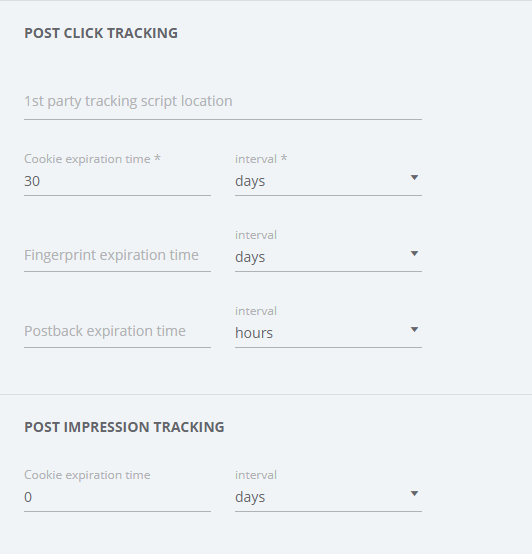 Here you have to provide values for cookie, fingerprint and postback expiration time (for post click tracking) or only cookie expiration time (for post view tracking). Besides that you have to add the 1st party tracking script location in case you are using 1st party cookie tracking. You can adjust the tracking for Convert. You can decide to use session tracking only (default), session and fingerprint tracking or only fingerprint tracking. For fingerprint tracking the general fingerprint expiration time will be used. A default product group is allocated to the Offer automatically. You can also create additional product groups. The product group id is equivalent to the event sid in the tracking implementation guides.